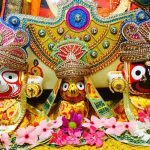 Categories: Jagannatha, Krishna, Krishna, Rath Yatra. 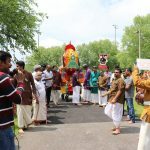 As ordained by Sri Swamiji HH Maharanyam Sri Sri Muralidhara Swamiji, GOD Atlanta chapter celebrated Sri Jagannath Ratha yatra in a very grand manner on Saturday,May 27th 2017. 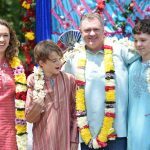 This event was very special to GOD as this also marked as a celebration to commemorate the tenth year anniversary of GOD. 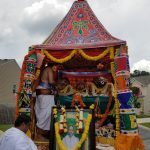 This is the first Sri Jagannath Swami Rathosavam by Global Organization for Divinity outside India and this historic event took place in Namapuram subdivision (CAG Atlanta, USA) . This rathosavam was led by satsang bhaktas Sabariji and Savitha ji coordinating with namapuram community bhaktas. 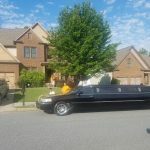 Lord of the universe made a royal entry to Namapuram in a beautifully decorated stretched Limousine. With all the little GK children and parents welcoming by sprinkling flowers and chanting Mahamantra, no one could take off their eyes from the beauty of Sri Jagannath Swami Parivar. Bhagavan made a grand entry to the welcoming tunes of various vadhyam, enthusiastic cheers of all kids, and entire place was resounding with Mahamantra chanting. 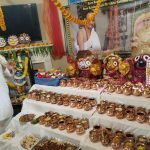 Jagannath Swami Parivar was beautifully decorated with colorful fragrant garlands. As mangala vadhyam and mahamantra chanting continued, Jagannatha Parivar got into the majestic and beautifully decorated Ratha . 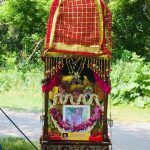 Chief priest of Sri Hanuman mandir Sri Lakshman Swamin and temple founder Sri Seshu Swamin performed the Rath pooja and the procession began. 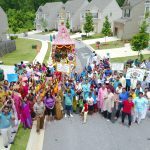 As Jagannath parivar went on Rath throughout the subdivision, various cultural activities were performed by all the gopakuteeram children of Atlanta(Namapuram ,Edgebrook, Whittington). Around 90 GK kids performed on cultural programs. 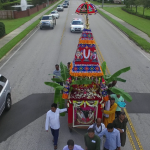 For the pleasure of Sri Jagannath, Astapathi dance, Narayeenam Paryanam and Mahamantra chanting throughout the procession, mangala harthi in many door steps, Neivedhyam every few minutes were all well-coordinated. Many families performed door to door Mangala Harathi and neivedhyam in front of their homes. 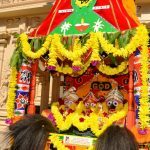 To quench the thirst of devotees, there were various food stalls placed in different locations of the procession route, to keep all the bakthas enthusiastic., Different varieties of coolants like buttermilk, fresh coconut water, water melon, kulfi and sweets were served. Once the procession was complete, Jagannathar parivar was offered with 108 preparations in special copper kalasam coordinated by Savitha ji. All community and satsang ladies lovingly cooked for Jagannath. 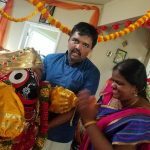 Sri Narayanji from GOD Boston beautifully explained about the significance of sri Jagannath Swami’s divine form and how Jagannath prasadam is not different from Jagannath himself. 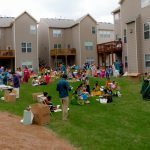 It was so lovely to celebrate Rathotsavam and chant Mahamantra and Madhuragitam with our dear GOD bhagavathas from various regions around North America. 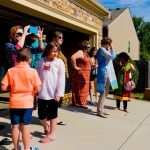 GOD Atlanta Chapter celebrated this Rathotsavam as one single family under the divine shelter of our beloved Guru Maharaj. The Jagannath Ratha Yatra brought entire Namapuram community including non Indian community members together and the message of ‘Chanting for world peace and harmony’ reflected in everyone’s hearts by Sri Swamiji and Sri Jagannath swami parama krupa when we all chanted and danced for mahamanra in harmony during the glorious procession ! Jai Jagannath ! Jai Gurunath !